The longest freshwater body of water in the world is Lake Tanganyika. It is also the second deepest (1.5km) and remarkably contains approximately 16% of the earths fresh water supply. 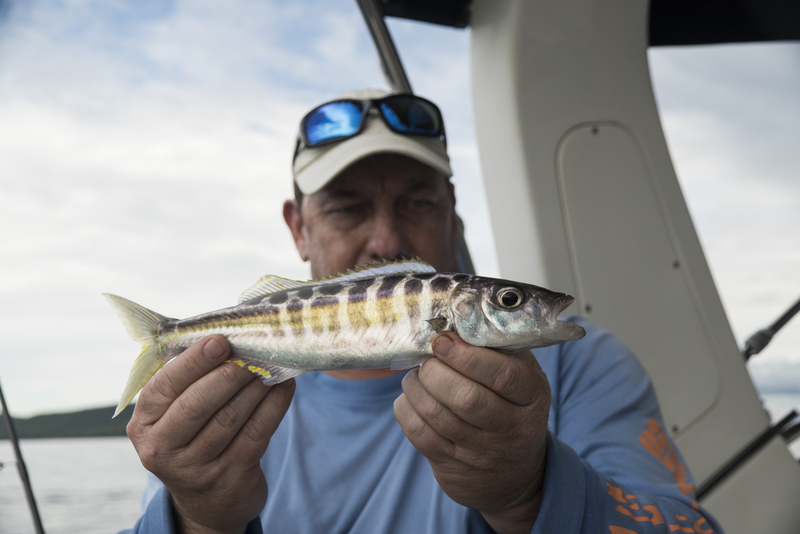 Holding over 350 different species of fish, it stands to reason that given the chance, any fisherman worth his salt would leap at the opportunity to explore this marine wonderland. 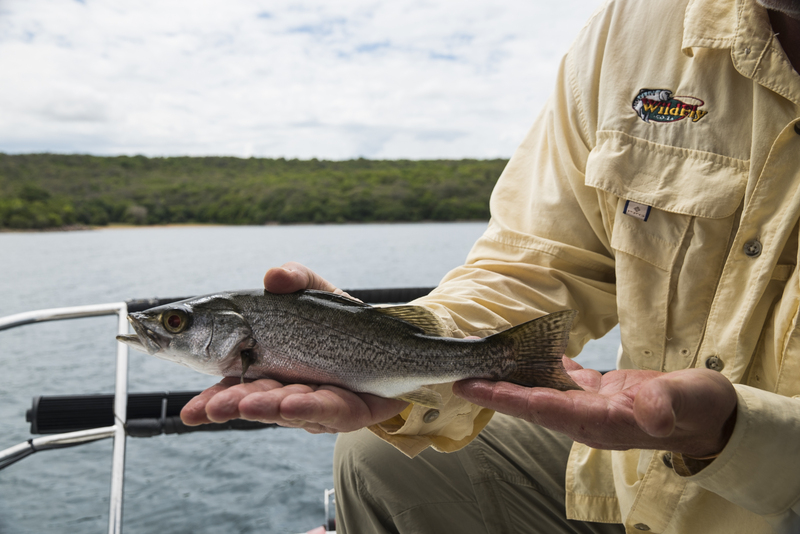 Luckily, and against considerable logistical odds, a lady called Sandra Valenza, an avid angler from Zambia, has over the past few years, obtained and revamped an iconic lodge in the Nsumbu National Park called Nkamba Bay. 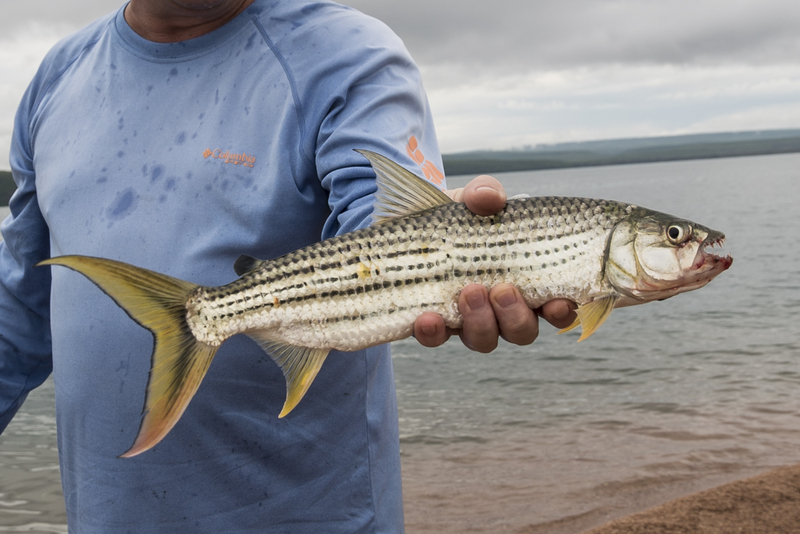 Although the lake as a whole, bordered by the DRC, Burundi, Tanzania and Zambia, has seen severe fishing pressure negatively affect fish stocks, Nkamba Bay itself lies in this area protected by the Zambian Wildlife Authority (ZAWA). 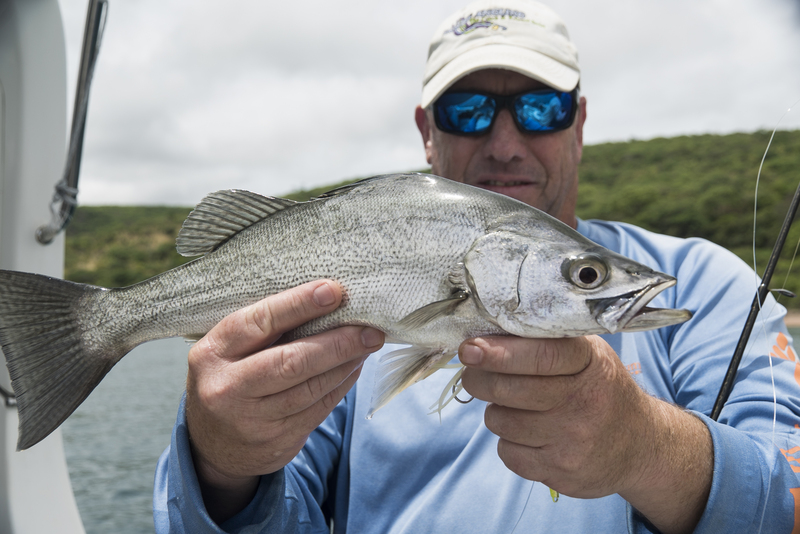 Flying on Proflight from Durban to Lusaka was a bonus for us, being based in KZN, and an overnight in Lusaka at the friendly PalmWood Lodge got us into the right frame of mind for a fishing trip. Tommo introduced me there to Nshima, Zambia’s staple maize porridge, and chicken curry-delicious. 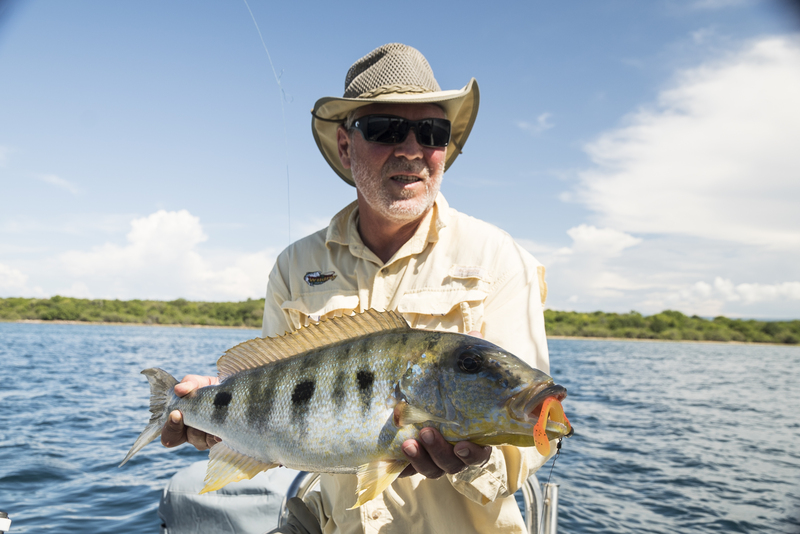 Another 2 hour flight on Proflight to Kasama and a private charter to the lake saw us duly ensconced at the pub on the elevated deck of Nkamba Bay Lodge with a cold beer and a spectacular view over the crystal clear water where a pod of hippos frolicked happily. 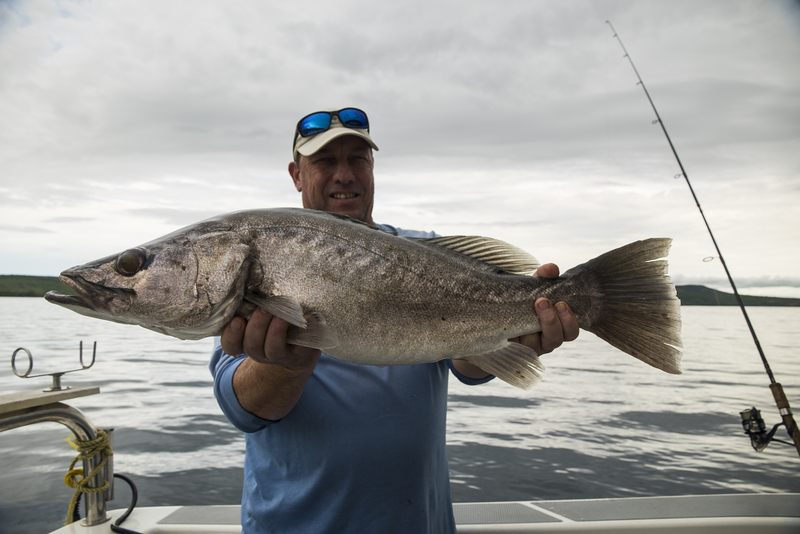 Tommo and I were fishing conventional spinning tackle while Jerry and Gareth worked flies off the large comfortable ocean going ski-boats. 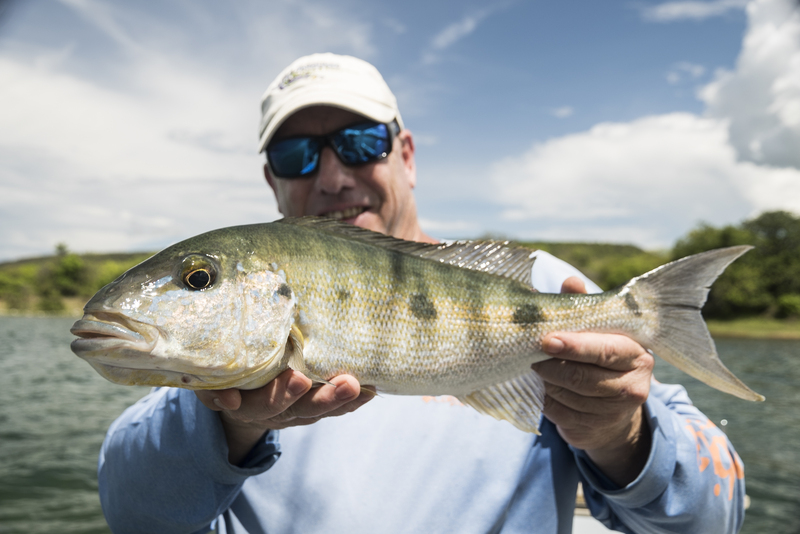 Given that there are 4 different species of Perch, Tiger Fish and a seemingly endless number of Cyclid species happy to chase a lure or fly, the opportunities are plentiful. The guys on fly were battling a bit with the wind drift making it difficult to get the flies down to anything more than around 10 meters. But even then, they were picking up plenty of the voracious smaller Cyclids and the odd juvenile Perch around the rocky shore line. 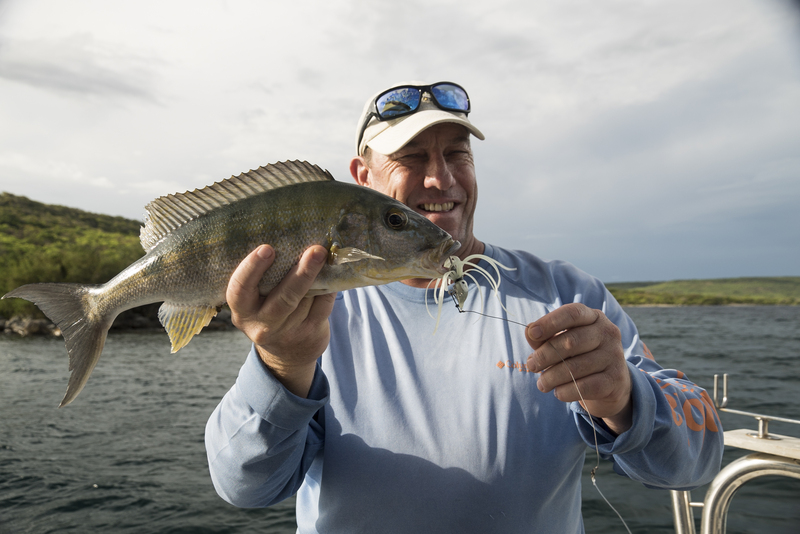 On spinners and lures, with light braid, we were more competitive and had racked up so many species on the first day we had lost count. Fish of every shape, size and colour attacked anything in their path. 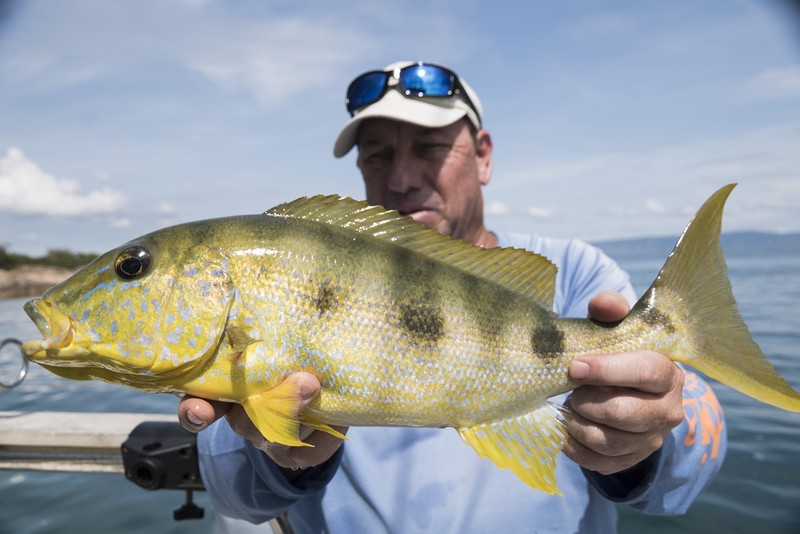 Interestingly, the largest Cyclid species on earth, called Nkupe, live in large numbers in Lake Tanganyika and when schooling near the surface will happily take a popper or stick bait. 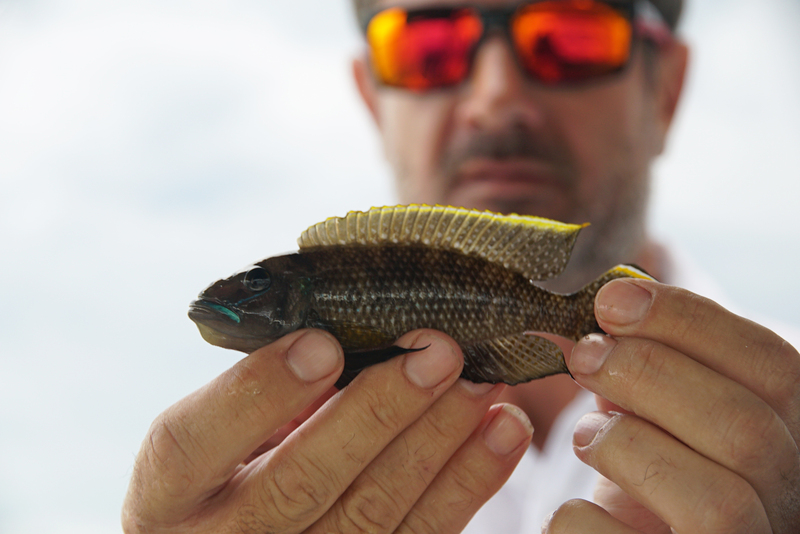 The sought after Peacock Bass found in the Amazon basin is also a member of the Cyclid clan, but comes second in size to the Nkupe. 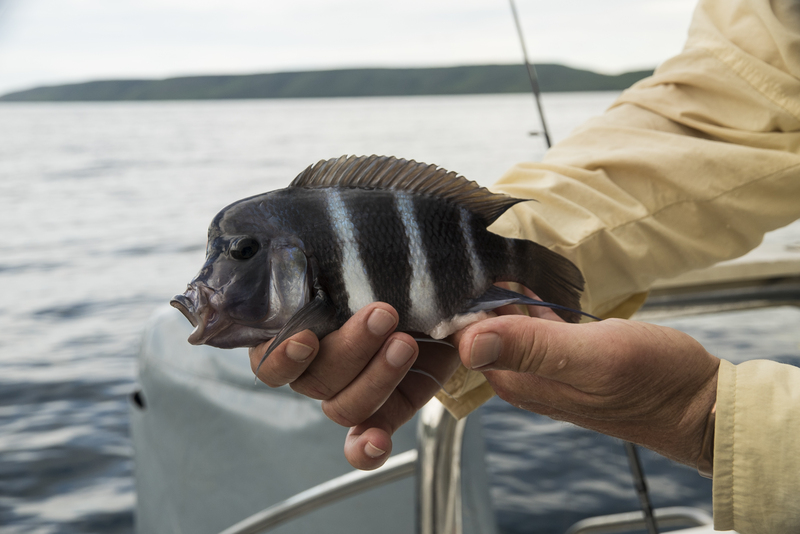 We found the larger Perch holding in deeper water over 30 meters, but unfortunately all attempts to bring them to the surface without severe Barotrauma (expansion of the swim bladder) and thus probably killing the fish, were futile. So we stopped fishing at anything deeper than 25 meters. 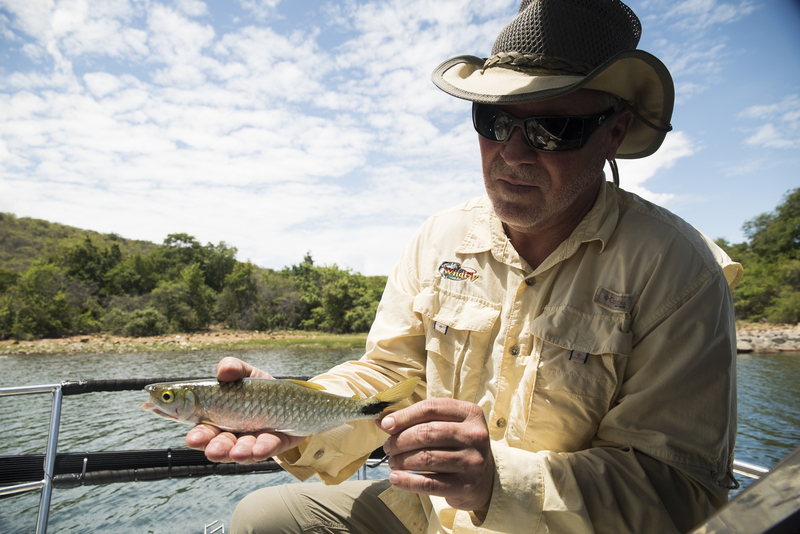 The fly guys managed to snag a couple of small Tigers, but other than one decent smash on a copper spoon we had no joy on the toothy critters. 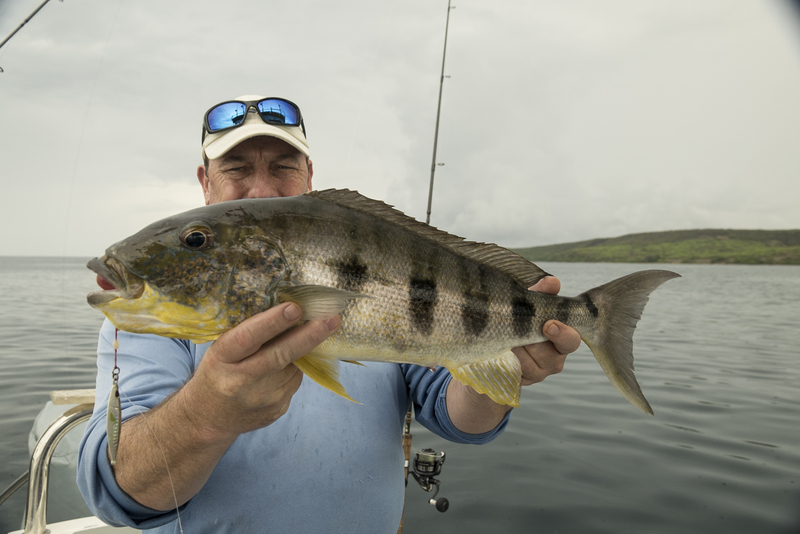 We all managed a number of Perch, but nothing over around 8 kg’s. 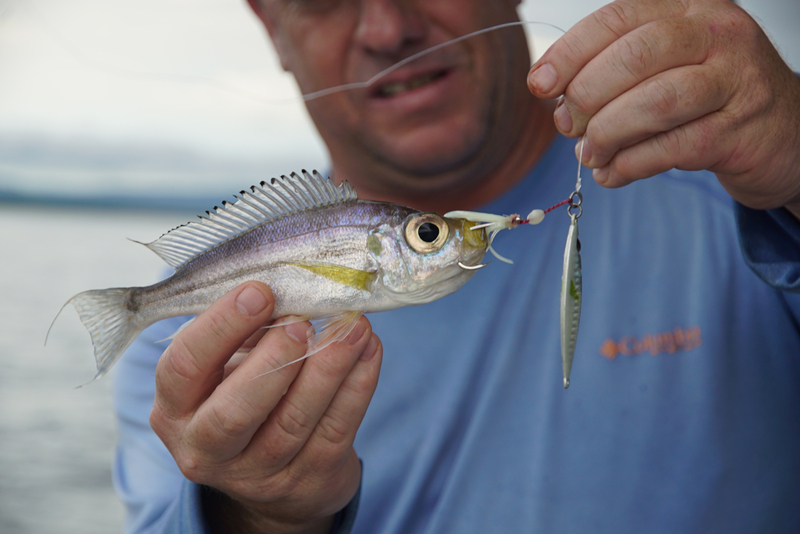 I found a large bright paddle tail soft plastic fished like a bucktail jig worked well for both the Cyclids and Perch. 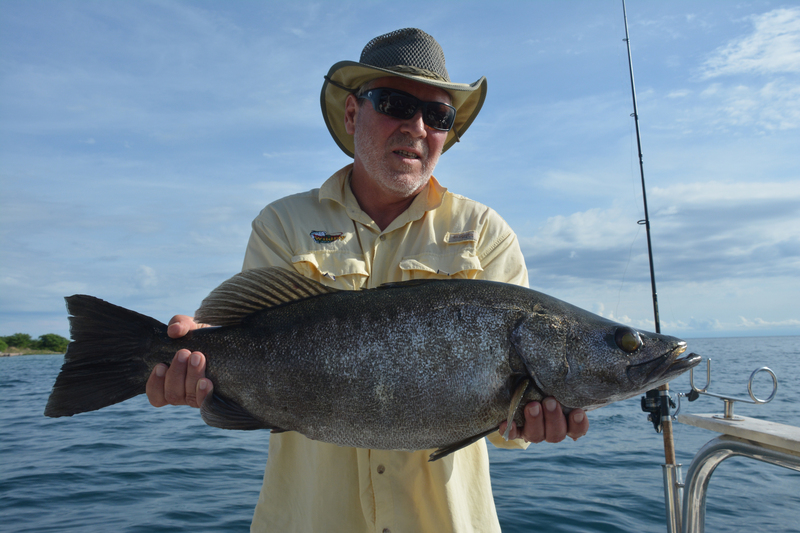 When fishing Lake Tanganyika its often hard to remember you’re in fresh water, the sheer magnitude of the lake, its extreme depth and seemingly endless number of species is far more reminiscent of blue water ocean fishing. For light tackle spinning and popping enthusiasts it’s paradise, and as mentioned if you’d like to tick off the world’s biggest Cyclid, this is where it’s at. Nkamba Bay Lodge is the only place to stay, due to being inside the National Park, good food and service, as well as comfortable air conditioned rooms. They also have a number of boats to choose from. 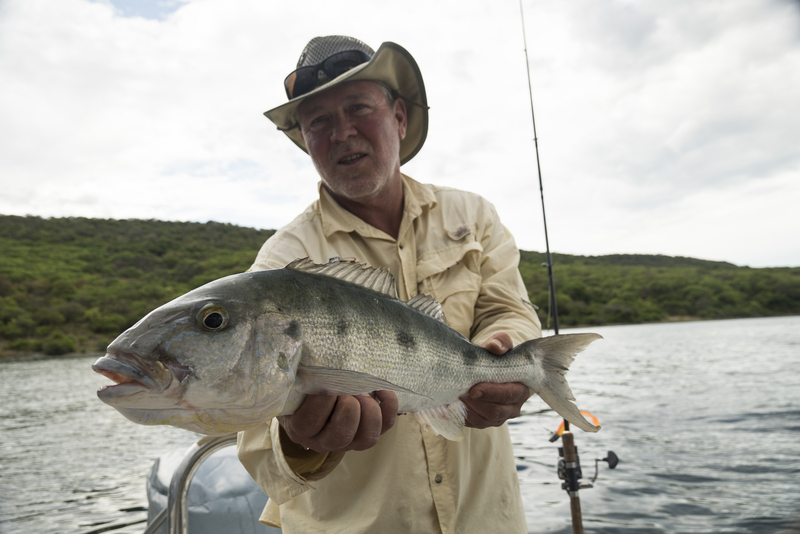 For something completely different try getting to this fresh water ocean and ticking off some unusual bucket list species.